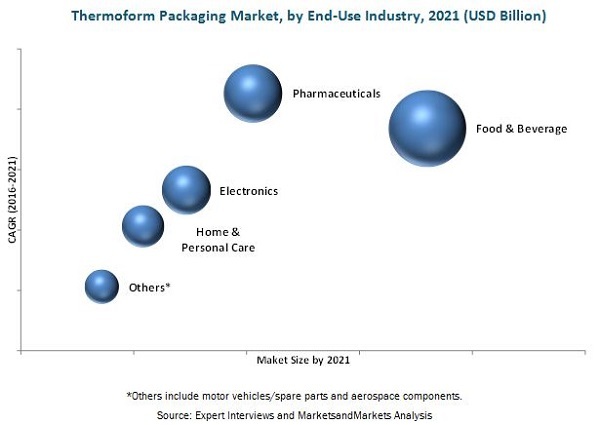 [236 pages report] The global thermoform packaging market was valued at USD 32.26 Billion in 2015 and is projected to reach USD 44.55 Billion by 2021, at a CAGR of 5.61%. The base year considered for the study is 2015 and the market size is forecasted from 2016 to 2021. The primary objective of the study is to define, segment, and project the thermoform packaging market size on the basis of material, type, heat seal coating, end-use industry, and region. The study also aims at strategically analyzing micromarkets with respect to individual growth trends, future prospects, and their contribution to the total market. It also provides detailed information about the main factors influencing the growth of the market (drivers, restraints, opportunities, and industry-specific challenges). 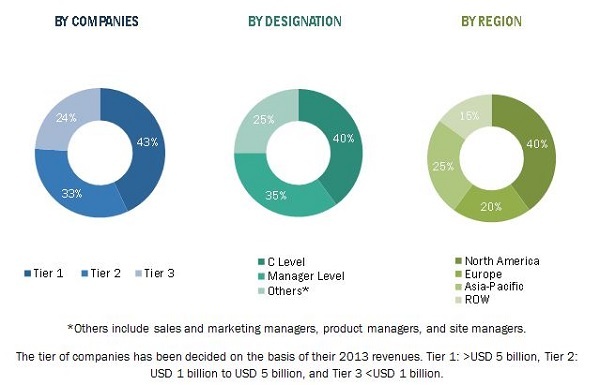 In addition to this, the study analyzes competitive developments such as partnerships, agreements, contracts, and joint ventures; mergers & acquisitions; expansions; new product developments; and research & development activities in the thermoform packaging market. The research methodology used to estimate and forecast the market size included the top-down approach. The total market size for thermoform packaging was calculated, and accordingly, the percentage was allotted to different sectors in each of the segments. This allotment and calculation were done on the basis of extensive primary interviews and secondary research. Primary research involved in this report includes extensive interviews with key people such as CEOs, VPs, directors, and executives. After arriving at the overall market size, the total market was split into several segments and subsegments. These data triangulation and market breakdown procedures were employed to complete the overall market engineering process and arrive at the exact statistics for all segments and subsegments. The breakdown of profiles of primary respondents is depicted in the figure below. The market ecosystem involves various stakeholders in the thermoform packaging market.. It first starts with the raw material suppliers such as WestRock Company (U.S.), Amcor Limited (Australia), Tray Pack Corporation (U.S.), and Lacerta Group, Inc. (U.S.) who provide the required raw materials to the manufacturing companies. This is followed by the regulatory bodies (such as Uniform Packaging and Labeling Regulation, Federal Food, Drug, and Cosmetic Act, and Fair Packaging and Labeling Act (FPLA)) and research & development team (such as DuPont innovation center at Geneva and Singapore) as the consumers want better and innovative solutions to their problems which are more sustainable and environment-friendly. The next level in the chain involves the manufacturing and the assembly team. This is taken care of by the manufacturers such as DS Smith Plc (U.K.), Constantia Flexibles GmbH (Austria), Sonoco Products Company (U.S.), Anchor Packaging (U.S.), Tekni-plex Inc. (U.S.), G. Mondini S.p.A (Italy), and Display Pack Inc. (U.S.). After this, the marketing and sales of the finished products takes place which is only possible if an efficient distribution channel is developed. Finally, the end products are distributed to the consumers through Novartis AG (Switzerland), BASF SE (Germany), and Archer Daniels Midland Company (U.S.). This research report categorizes the thermoform packaging market based on type, material, heat seal coating, end-use industry, and region. MarketsandMarkets projects that the thermoform packaging market size by value will grow and reach USD 44.55 Billion by 2021 at a CAGR of 5.61% between 2016 and 2021. The market is growing in accordance with the growth trends of the converting and packaging industries. Factors such as minimal packaging waste; increasing demand from fresh food and beverages, home & personal care goods, and pharmaceuticals industries; and growth of the retail industry have driven the global thermoform packaging market. The thermoform packaging market is segmented on the basis of type, heat seal coating, material, end-use industry, and region. On the basis of type, blister packaging accounted for the largest market share, in terms of both volume and value in 2015. In terms of heat seal coating, the water-based heat seal coating is projected to grow at the highest rate during the forecast period. The water-based heat seal coating provides a firm bond between corrugated and polyethylene skin pack films, thereby reducing several adhesion challenges of thermoform packaging and driving the thermoform packaging market. On the basis of material, plastic accounted for the largest market share, in terms of both volume and value in 2015. On the basis of end-use industry, the food & beverage segment accounted for the largest market share, in terms of both volume and value. Increasing disposable incomes of people in developing countries and changing preferences of manufacturers for sustainable packaging are some of the factors that are driving the thermoform packaging market. On the basis of key regions, the market for thermoform packaging is segmented into North America, Europe, Asia-Pacific, and the Rest of the World (RoW). Europe accounted for the largest share among all the regions in 2015. This is mainly due to developed economies in Germany and the U.K., coupled with growing applications of thermoform packaging in the food & beverage and pharamceuticals industries. Non-suitability to pack heavy items is a major restraint for the thermoform packaging market. Thermoform packages have less weight-bearing capacity. Stacking of heavy products might put excess strain on the plastic film in which they are packed, thus causing the package to break while handling, storing, and transporting. Hence, they are not suitable for the packaging of heavy items. Mergers & acquisitions and new product launches were the major strategies adopted by most players in this market. Companies such as Amcor Limited (Australia), Bemis Company, Inc. (U.S.), WestRock Company (U.S.), E.I. du Pont de Nemours and Company (U.S.), DS Smith Plc (U.K.), Constantia Flexibles GmbH (Austria), Sonoco Products Company (U.S.), Anchor Packaging (U.S.), Tekni-plex Inc. (U.S.), G. Mondini S.p.A (Italy), and Display Pack Inc. (U.S.) were the key players who adopted these strategies to increase the customer base in key markets. The leading thermoform packaging manufacturers are focusing on emerging countries that are estimated to show potential for industrial development in the near future.